Performers include: David Boreanaz, Max Thieriot, Neil Brown Jr., AJ Buckley, Toni Trucks, Jessica Paré, and Judd Lormand. 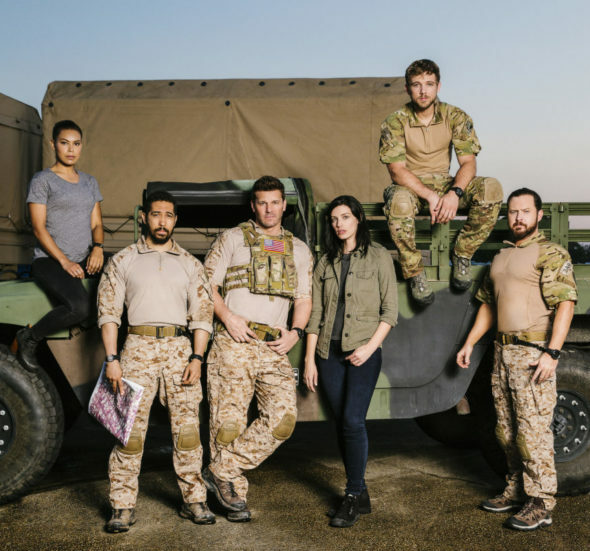 A military drama, the SEAL Team TV show centers on an exclusive Navy SEAL unit as they train for, plan, and risk their very lives to carry out perilous missions for the sake and honor of the U.S.A. Fierce and focused Jason Hayes (Boreanaz) leads the Tier One team. His personal life takes a backseat to his military service and suffers as a result. Ray Perry (Brown) is Jason’s confidant. After serving together for so long, the two have their own way of communicating with one another and a relationship built on trust and time. Meanwhile, Sonny Quinn (Buckley) is a highly skilled, loyal soldier whose reputation might be a bit frayed around the edges. He generally has to resist his worst inclinations to act against his own best interests. Young Clay Spenser (Thieriot) is a second general SEAL and aspires to join Hayes’ unit. This multi-lingual young man is nothing if not driven and dedicated. Rounding out the team are logistics officer Lisa Davis (Trucks), who makes sure they have everything they need for their assignments, as well as CIA analyst Mandy Ellis (Paré), who willingly sacrifices whatever necessary, to thwart terrorists and rid the world of malevolent threats. Despite the hardship it causes them and their families, this SEAL team is ready, willing, and able to embark upon secret missions at the drop of a hat. Their love of country and deep resolve is unmatched. What do you think? Do you like the SEAL Team TV series? Should this TV show be cancelled or renewed for another season on CBS? I love Seal Team keeps me my sit knowing this is what our real life Seals do for our country. Please renew. With the crappy shows out there they are the best of the best. Fantastic Show,,,Gripping, Intelligent, Great Characters. Never has our family been so enthralled w/TV SHOW…..How can there even be a “thought” of not renewing next season? Each season of Seal Team, gets better, more intense, and always leaves on a cliff hanger. It is an awesome show, i enjoy every episode. keep your way and make another season. thanks a lot.